Interview with Rabbi Avraham Feigelstock. Interviewed by Gary Averbach for The Scribe, 2018. Rabbi Avraham talks about the founding and operation of Kosher Check (formerly BC Kosher), on which he serves as supervising rabbi. 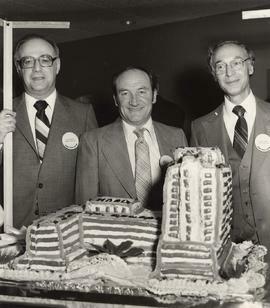 Photograph depicts three unidentified men with a 3-D model cake of the centre.Written on the verso: "P. 7 - 2 x 4 1/4 55%. Nov 20/82. Cake Model Haro Park Centre." Oral Interview with Carol Herbert. Interviewed by Alisa Lazear and April Thompson for Feeding Community podcast. 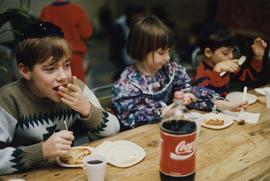 Photograph depicts children eating latkes.Written on the verso: Dec. 27/90 p. 9 (left pic). 1 cols. Latkes. Chabad." Interview with Claire Hammer and Estelle Sanderson. Interviewed by Debby Freiman. Photograph depicts a sheet cake which reads "Congratulations + Best Wishes for opening of your "New Home" from Ladies Auxiliary" . Photograph depicts three children getting cotton candy.